Figure 1: [2+2] cycloaddition reaction of alpha-styrylpyrylium (TFMS): left, monomer; right, dimer structure. For the homogeneous single-crystal to single-crystal transformation, optical excitation wavelengths of 520, 550, and 575 nm were used. The back -transformation from the dimer to the monomer is driven by thermal energy. 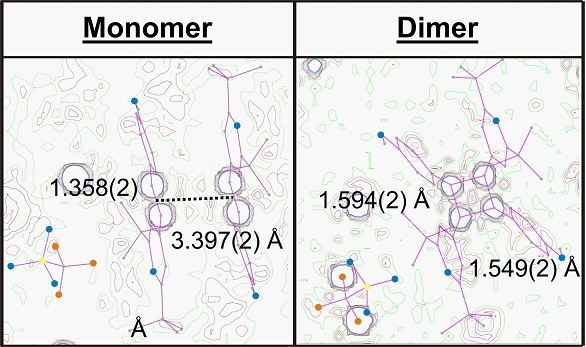 For this, the temperature was set to T = 370 K.
Figure 2: (Left) Electron density map of the pure red monomer phase and (right) electron density map of the pure yellow dimer phase as revealed by time-resolved photocrystallographic techniques. During the formation of the single bond in the photodimerization reaction, the distance between two monomer molecules diminishes from 3.397(2) to 1.594(2) Å, and the 1.358(2) Å double bond increases to a 1.549(2) Å C-C single bond. Besides the flipping of the phenyl residues toward the cyclobutyl ring, the cycloaddition reaction also causes a rotation of the TFMS anion. 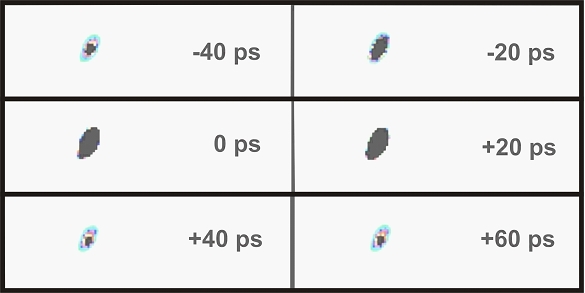 Figure 3: Picoseconds transformation: time-resolved “movie” of the intensity variations of the (012) Bragg reflection upon pulsed laser excitation. Figure 4: Ultrafast rise and decrease of the (412) Bragg diffraction peak intensity of the dimer phase for the time points 100 ps, 0ps and 100 ps. 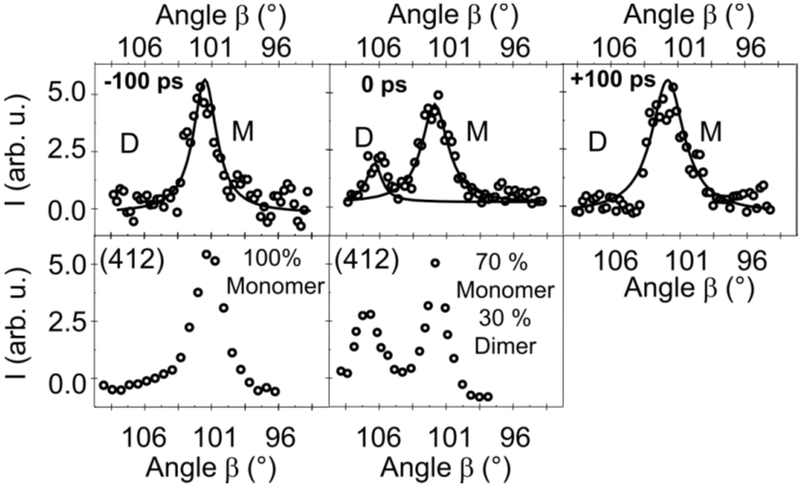 The splitting of the (412) Bragg diffraction peak for the monomer and dimer phase monitors the changes of the alpha-angle of the monoclinic unit cell from 101.5° to 106°. (Right) As reference, the (412) Bragg diffraction peak for the pure monomer phase and for a mixture of monomer and dimer phases within one crystal (70% monomer, 30% dimer). Published as: Time-Resolved X-ray Diffraction of the Photochromic alpha-Styrylpyrylium Trifluoromethanesulfonate Crystal Films Reveals Ultrafast Structural Switching, J. Am. Chem. Soc. 79, 131,15018-15025 (2009). The ultrafast structural dynamics of the [2+2] photocycloaddition of alpha-styrylpyrylium trifluoromethanesulfonate (TFMS) has been studied for the first time at DESY and the ESRF. During the photoreaction, optical and infrared spectroscopy confirms the colour change of alpha-styrylpyrylium (TFMS) crystals making the system to an ideal candidate for holographic storage devices based on organic materials. The present photocrystallographic studies (with high spatial resolution) allow for an electron density analysis of the overall reaction kinetics, revealing the mechanism of bond-breaking and bond-formation. It could furthermore be proved how the reaction is influenced by the rearrangement of the surrounding rest. Picosecond time-resolved X-ray diffraction studies allow for the monitoring the photoreaction in crystalline thin films under experimental conditions where the transformation times are greatly enhanced. It has been found that alpha-styrylpyrylium TFMS undergoes an ultrafast photoreaction to the dimer product state and back-reaction to the monomer reactant state which is temperature driven. The present experiments indicate that the system reacts on time scales which are the fundamental limiting ones of two-quantum systems and therefore has the potential to be used as an ultrafast organic molecular switcher. During the second half of the 20th century, the systematic investigation of organic solid-state reactions and the growing number of examples of organic solid-state reactions explored have witnessed to their value not only because they are much more selective concerning the product distribution but also because they are environmental friendly and proved to be useful in the context of “green” chemistry. Photoinduced processes in organic single crystals have been studied for a long time1, and in recent years their potential for possible technical applications in a variety of photosensitive devices2 has made them the focus of much research not only in optical data storage3 but also in template-controlled synthesis in which at least one of the reaction steps is photo-induced. Solid-state photochemical reactions are highly dependent on the geometry of the reacting compounds and their products. Much experimental work has been undertaken to understand the thermodynamical properties of solids undergoing solid-state reactions4, the influence of the spatial arrangements of the molecules within the lattice, their optimization (i.e., crystals dispersed in protic or aprotic solvent), or their temperature dependence. However, very little is known about the kinetics of such chemical reactions. Time-resolved crystallography allows for monitoring the structural changes of solid state reactions as a function of time allowing for revealing the reaction mechanism and the reaction control factors of a reaction from a structural point of view. Photoinduced solid-state reactions can be separated into two categories: reversible and irreversible reactions. Furthermore, one may distinguish between homogeneous single-crystal to single-crystal dimerisation reactions and heterogeneous dimerization reactions where the long-range order is destroyed. Here, we have investigated the photodimerization reaction of alpha-styrylpyrylium trifluoromethanesulfonate. Upon excitation with visible light, the system undergoes a colour change from red to light yellow, which can reversibly be switched back upon heating. Since the process is reversible the system is an ideal candidate for holographic optical storage devices based on organic materials. By combining high-resolution photocrystallographic experiments with picosecond time-resolved X-ray diffraction experiments we could prove that the optical changes can directly be deduced to a bond breaking / bond making mechanism as shown in Figure 1. High-resolution photocrystallographic studies of alpha-styrylpyrylium (TFMS) single crystals were performed at the F1 and D3 beamlines at the DORIS III storage ring. A X-ray energy of 20 keV with an X-ray beam size of 0.4 × 0.4 mm2 was used. The samples were mounted on a four-circle diffractometer (D3) and on a kappa diffractometer (F1) on which optical laser sources have been coupled to. At low temperatures, the photoreaction was considerably slowed down, allowing high-resolution structural investigations with spatial resolution down to d = 0.6 Å. Refinement of the crystal structures of the pure monomer phase and the pure dimer phase is based on about 40 000 reflections. The high data resolution obtained allows for the refinement of the structure up to a level of electron densities. The picosecond time-resolved measurements were performed at the ID09B beamline of the ESRF5. These X-ray diffraction studies allowed for monitoring the photoreaction in crystalline thin films under experimental conditions where the transformation times are greatly enhanced. Figure 3 shows the movie of the time-evolving (012) Bragg reflection of alpha-styrylpyrylium TFMS crystals upon photoexcitation. Note, that the time-resolution of the experiment is limited by the X-ray pulse width of the ESRF synchrotron pulses. The data evaluation of the picosecond time-resolved crystallography studies reveals that alpha-styrylpyrylium (TFMS) undergoes an ultrafast photoreaction from the monomer state to the dimer product state. The back-reaction to the monomer reactant state is temperature driven. Most significantly, the formation of whole “short living” crystalline domains with intermediate character has doubtlessly been proven by time-resolved crystallography. Figure 4 compares the result of the picosecond time-resolved experiments (left side) with the “quasi-stationary” ones (right side) on the example of the (412) Bragg reflection. Around time zero, the creation of a well-defined dimer Bragg peak has been investigated belonging to the short-living dimer phase. Under the optical excitation conditions used the system undergoes a whole bulk transformation as has been investigated by the ultrafast formation and decay of Bragg peaks originating from the switching of whole domains to the dimer phase. Kinetic analysis based on the JMAK model, reveals that the mechanism is not cooperative. The kinetics could be deduced as a two-state process with changes of the molar fraction of the monomer, respectively dimer phase. The population of the states depends on the number of optical photons and the optical excitation wavelength. Depending on the temperature of the system, for thin crystalline films ultrafast time-resolved grazing incidence experiments proved the reversibility of the photoreaction with time constants faster than 30 ps. The present experiments indicate that the system reacts on time scales which are the fundamental limiting ones of two-quantum systems and therefore has the potential to be used as an ultrafast organic molecular switcher. (1) Cohen, M. D.; Schmidt, G. M. J.; Sonntag, J. J. Chem. Soc. 1964, 2000. (2) Irie, M.; Kobatake, S.; Horichi, M. Science 2001, 291, 176. (3) Ohba, S.; Hosomi, H.; Ito, Y. J. Am. Chem. Soc. 2001, 123, 6349. (4) Enkelmann, V.; Wegner, G. J. Am. Chem. Soc. 1993, 115, 10390.